The Ed Sheeran X Signature Edition Guitar features Ed Sheeran’s Signature “X” sign on the headstock and down the fretboard. The six times platinum-selling album’s logo is inlayed in soliad koa on a solid spruce wood top. The model comes stage-ready equipped with Fishman Isys T electronics, Martin SP Lifespan strings and a padded gig bag. Want to win? 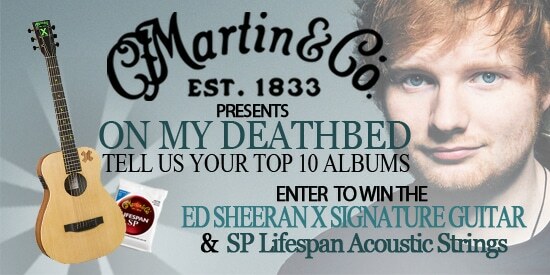 Simply click the button below and tell us the “ten albums you’d take to the other side,” and you’ll be entered to win a Martin Ed Sheeran X Signature Edition Guitar and SP Lifespan Acoustic Guitar Strings. Selected entries will be reprinted in our September/October 2015 issue. Deadline: July 30, 2015 at 11:59PM CST.